These valve springs are for upgrading to a hydraulic roller cam from a hydraulic flat tappet when using our outer springs. Many people have purchased our cylinder heads with a flat tappet hardware setup and later decide to upgrade to a roller cam. This is exactly what you will need to add to your existing springs, and as mentioned they work perfectly with our # 272 outer springs, and may work with others on the market. When used with our outer springs, these inner springs will accommodate a wide range of hyd. roller cams from 610 lift on down. Many of our customers have upgraded to roller cams in the past, and call us to find out what all they will need to change out, and these springs are exactly what you will need. We have an abundance of them, due to the fact we ordered more than needed. We are offering these springs at a greatly reduced price, and when they are gone, the price will increase considerably. To achieve perfect spring height, you may need to shim the springs, or possibly remove some of the existing shims that are in your current setup. Always use a spring height checking device. See our other listings for many much needed valve train accessories. This is full set of inner springs. The chart above contains the ratings of your complete set of springs after you have added these inner springs to your existing # 272 springs. This chart is only relative if you couple the inner springs with our existing springs that you have in your heads, provided you purchased the heads from us or from someone that uses springs like ours. If you have purchased a set of our heads setup for a hyd. flat tappet cam, (sbc, bbc, ford or bbc) in the past 5 years, then the springs used in them are all the # 272 series. You may get by without having to upgrade to the longer valves when going to a roller cam if you use a +50 set of valve locks, but the spring pressure is a bit on the high side. You may have to upgrade to the .200 long valves when changing over to a hyd. roller setup using these springs. We purchase these springs in bulk cases of 100 ct., so no fancy package. IMPORTANT NOTE, THE ARTICLE BELOW IS AN EXCERPT FROM OUR COMPLETE SPRING PACKAGE. IT DOES GIVE YOU AN INSIGHT ON VALVE SPRINGS. We have noticed several sellers offering one size fits all valve springs for dual use in hydraulic flat tappet and hydraulic roller cams. We are positively sure that the one size fits all is not the proper type hardware to use on your heads. When using a hydr. roller cam, we not only use a dual spring and damper combo, but also use .200 long valves instead of the .100 long. The .100 long valves are used on our hydr. flat tappet setups. As many of you may know, a hydr. roller cam is usually higher in lift and duration, requiring a longer valve, but all roller cams use a more aggressive spring setup regardless of lift, to keep the roller lifters planted on the cam lobe. They are very prone to wanting to bounce the roller lifter away from the lobe due to the very different lobe design on the cam, and the roller on the lifter also tends to contribute to this. These sellers using a one size fits all setup are trying to hit a happy medium, and most head builders we know of are completely against it, as well as many head companies such as Dart, etc. If they have this setup somewhere in the middle, then it would be too much for the hydr. flat tappet cam, and create a wear issue in our strong opinion. Putting too much pressure on flat tappet cams is a sure way to kill the cam. It's just another way of increasing profit for the seller without regard for the customers' best interest, as we see it. We recommend the correct spring for your setup and never is it the same on a hyd. flat tappet and a hyd. roller cam. The spring requirements between a roller cam and flat tappet cam are dramatically different. Even the oddball solid flat tappet cam has its own unique setup, depending on the lift. The one size fits all hardware claims to also work on these cams. We know of several sellers offering this insane setup to unsuspecting buyers, and itâ€™s not the proper way to set up a set of heads, in our very strong opinion! We have to charge a slightly higher price for a set of heads using a hydr. roller cam and we can promise you, it's a must that the hardware be correct for this type cam. Call up any cam manufacturer and tell them you want to use a one size fits all setup on their hydr. flat tappet cam or hydr. roller cam and they will tell you this is not possible, and depending on the spring pressure, it can't serve both properly. Valve float on the roller setup, or extreme wear for the flat tappet cam, depends on what cam this crazy setup is closer to. We would not even consider this type hardware, and believe me, the simplicity of it is appealing. Take heed to the warning above, and rest assured we will never guide you in the wrong direction when it comes to valve springs. Some cam companies may isolate the spring recommendation a bit closer, and tell you that you need a certain spring rating for use with a certain cam, and you can vary lb. rate slightly lower or higher without any ill effects, but never will they tell you to use the same springs you used on a non-roller cam as you would with any roller cam, or visa-versa. We have seen the low cost springs on the market, at what appears to be very good prices. My advise is to avoid them like the plague. Not only is the quality questionable, but we have also found the lb rating to be grossly inaccurate from what they claim to be. We have a spring tester in our machine shop and this not your Mickey Mouse tester many garages use. Ours is worth well over $1,500. We build heads costing over $10,000 per pair and need this type of spring tester. What we have found besides the lb rating issue is that these inferior, low cost springs have very poor progressive rate characteristics to them. Their appearance is also the worst we have ever seen. 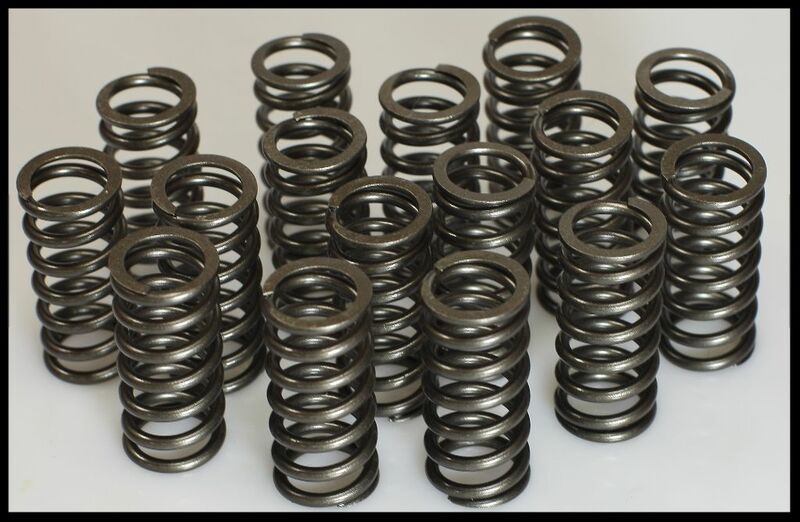 For those of you that don't know much about springs, I can tell you one thing for sure, valve springs have several very critical factors in their design, with little room for error, or power loss or failure will result. One of the factors that is to be addressed is how long the spring can operate before it takes "set". This in layman's terms means that all springs become lazy in how quick and firmly they rebound. Springs that take set too soon and too much will cause an engine to run poorly. Even the best springs on the market are prone to this, but to much lesser extent, and will run much longer before it becomes an issue. As many of you know, we do sell many off-shore products, but when it comes to valve springs, we will most likely never offer an off-shore spring set. The ones I have seen are absolutely terrible. We are at master warehouse distributor level with Pioneer, and due to the massive amount of hardware we purchase from them, we are able to sell these springs at a very good price. You will be much better off paying the few extra dollars vs. purchasing the low end springs regardless of how low the price may be. We know of a very large valve hardware supplier that purchases many products from off-shore companies, but like us, they never buy offshore valve springs. As a matter of fact, they carry Pioneer springs. A spring has very dynamic characteristics to it, so trying to copy a valve spring can turn out all wrong for some off-shore manufacturers if they lack true engineering skills. A valve spring is a moving part, and moving at a very high rate of speed with extreme levels of pressure against it. Harmonics are involved, high temperatures, wear points must be addressed, etc. There is little room for error. The spring must operate for a long time, and precisely. The metal used is very important as is the heat treating process, not to mention the overall design and size must be correct. Just to give you an example of how critical a simple looking spring can be, most high level race engines use springs costing over $500 per set. That right there tells you that springs are very complex. By the way, those high level race cars using those expensive springs will usually replace them every season or sooner, as the slight power loss becomes evident. Now think about all of this before you go buy a set of $29 springs for your street-rod. If getting a set of low grade springs is not bad enough, having the incorrect spring is worse. We will never give you the incorrect spring for your cam. You may also see low cost springs on the market that are in the 1.25" range with a correct spring rating. The problem with these is they tend to wear out at a very fast rate, due to their small physical size. One exception to this rule are some of the high grade bee-hive springs on the market. Those particular springs are usually very high quality, and the size rule does not apply to them. Some of the ultra low grade springs we've seen were not small diameter, they were actually larger than ours, around 1.50", but the wire diameter was much smaller, therefore making its larger diameter irrelevant to its durability. When springs get to the 1.5" diameter size, they tend to cause issues with roller rocker clearance, and the need to cut the base area larger on many oem style heads. Our solid roller springs are of this larger diameter, and are made from very thick wire, but our stainless roller rockers clear them comfortably. Final thought, we feel the same way about off-shore lifters, avoid them like the plague as well. As you can see in the picture below, the inner springs are what you will receive. This picture is of the complete set of inner springs. They fit perfectly inside of the larger outer spring we use in all of our heads. Do not remove the internal damper when adding the inner springs to your larger outer springs. The damper is a flat ribbon like spring that dampens valve spring harmonics.